Traditional methods for the monitoring of land surface morphology such as field investigations are cost-intensive, time consuming and limited regarding spatial and temporal coverage. Nowadays, the increasing availability of remote sensing data allows for the comprehensive mapping of geomorphological features and for the continuous monitoring of surface morphology changes at high spatial and temporal resolutions. Within MORPH, novel methods for mapping, monitoring and modelling spatio-temporal dynamics of surface morphology, focusing on the investigation of landslides and volcanic deposits, are developed by an integrated analysis of optical and radar remote sensing data. 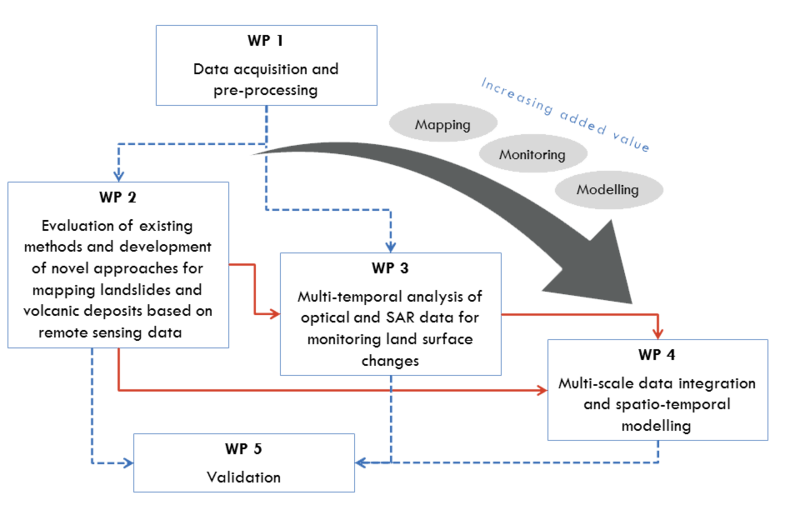 To gain added value from the analysis of different remote sensing data, a digital data model that allows for the integration of data/analysis results at multiple scales will be implemented for spatio-temporal modelling of land surface trends and dynamics. The methodology is developed for two study areas in Iceland (Öræfajökull and Hekla) which are highly dynamic in their geomorphic evolution and are characterised by progressive mass displacements and surface deformation. From mapping to monitoring to modelling – the concept of MORPH, allows for the provision of results with high information content. Existing mapping approaches can be complemented, and new insights on spatio-temporal changes will be achieved. Furthermore, monitoring surface changes can contribute to a better understanding of mass-transport systems, to detect related environmental variability and to assess natural hazards.